So it had finally arrived, our first mock hunt of the season and what a superb start it was. Greeted on arrival with a stirrup cup, the scene was set for a great day! With a 60 horse strong field we set off towards Nore Hill at the top of Warren Barn farm where the view was as always outstanding, our hounds (Geminnie and Debbie Cunningham, Annette Murphy, Lionel Rummell, Grace findlater and Frankie Hacket), followed by our hunts woman Michala Blackburn flushed our fox (Louise Squire) out and the chase was on! As we came over the second set of jumps one of our hounds (Geminnie Cunningham) took an unfortunate fall but was soon remounted safe and well. After stopping for a sip from our hipflasks, we were off again towards our first hedge of the day, for those who chose to jump (as all jumps are optional) cleared it easily led by our field master; Jean Bywater. Then for our first gallop across the top of Warren Barn. By this time, the horses and riders were feeling the heat from the baking September sun! We cooled off down the track on the way back to Warren Barn where we checked and gathered ourselves before the steep climb up the Bowl, which sorted the men from the boys. 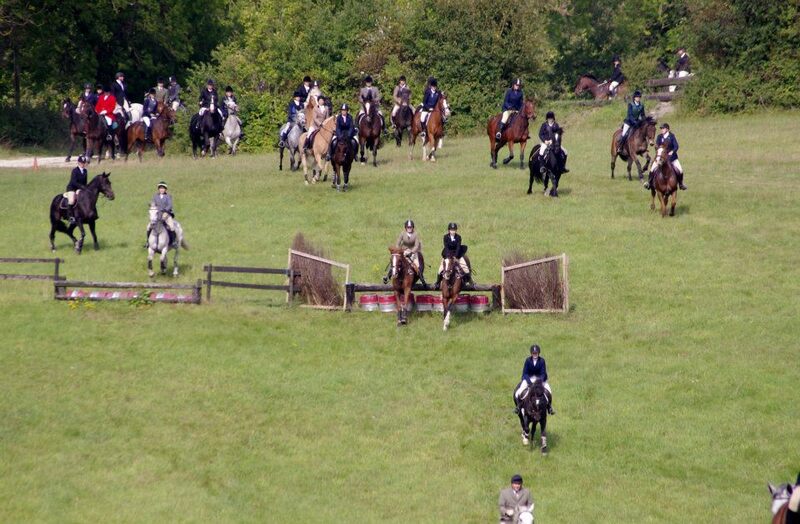 We then went on towards one of our bigger hedges where fox, hounds, masters and few field put on a show for the spectators,which we seemed to have a lot of at our opening meet. We then proceeded down into the valley, where we jumped the barrels and tyres, which some of the field took at a fair lick and for everyone's favourite blast up Green Hill. We took advantage of our not so fizzy horses to catch our breaths and wet our whistles. Our tricky fox had slipped away by this point leaving the hounds to seek her out further along the valley. She then took advantage of Warren Barn's Cross Country course and led the field safely over the coffin and the drop hedge. Our sneaky fox evaded our hounds yet again for quite some time and took Michala and her hounds on a merry dance. Eventually our hounds closed in for the kill successfully concluding a highly enjoyable first meet of the hunting season. It was great to see so many faces, old and new, gaining so much pleasure and experience, from such a traditional past time in a sociable and friendly environment. Looking forwards to seeing you all at our next meet on 27th November at Kennel Farm. Tally Ho until then. At the last Warlingham and District Horse Club AGM, I polled a few of our members to see what we were doing right with the showjumping and what we could improve on. Many of you were kind enough to tell me about the kind of classes you would like to see incorporated at our showjumping shows. The problem is that with the variety of suggestions I received, we simply couldn't fit them in around other classes at one of our Winter Showjumping shows. So back in Spring, when it became clear that we had no option but to cancel the Eventers Challenge due to the hard ground back then, Caroline Jaycocks and I went for a drink together and dreamed up a show where we would hold as many classes as we could of those which were suggested to us at the AGM. The Showjumping Extravaganza was born! Firstly, I would like to pass a BIG thank you to all those who helped us set up the showjumping rings on Saturday afternoon. It made a fantastic change to have so many hands on deck and we were all done in a little over two hours. What a result! 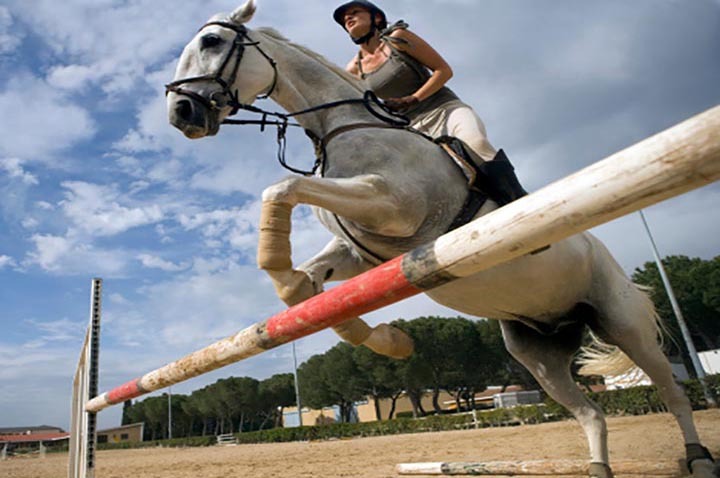 The morning of the Showjumping Extravaganza comprised a teams competition, where random teams of three jumped over three separate heights - bottom hole, 2' - 2'3" and 2'6 - 2'9". Whilst we had put aside space for up to 20 teams for this class, in the end 10 teams competed for the absolutely FANTASTIC rosettes kindly provided by our sponsors of the class, Salient Fencing. Still, it made for a relaxing morning's showjumping action. Clear rounds were few and far between and kept the judges guessing right up until the end of the class. The ultimate champions were Team 5, comprising Sadie Whitfield, Anna Deeley and Sarah Edmonds - very well done ladies! We then went on to hold a horse and hound showjumping class, where the riders had to jump a course of 2' jumps, gallop back to their pooch handlers, hand over (or in some cases throw over!) their crops and then the pooch handlers together with canine companions went on to jump a course of five 2' jumps themselves, including our infamous horseshoe jump. This class was incredibly well supported by our spectators, the best of the cheering reserved for those brave hounds and their handlers. The honours went to Sarah, Lucy and Honey who jumped a clear and very fast round between them - congratulations! 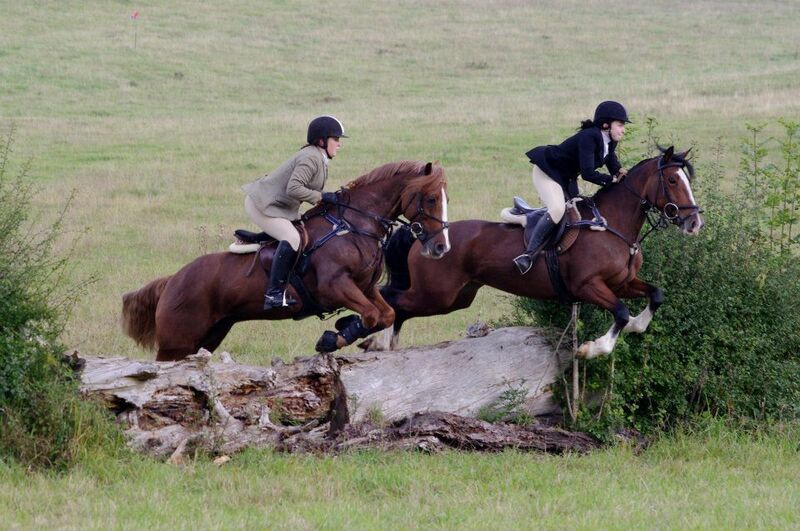 Many riders have asked me why we don't run bigger open classes at our Winter Showjumping competition. Historically, this has been because there hasn't really been the demand. In view of the renewed interest in open classes, we therefore held an open class at the Showjumping Extravaganza, with showjumps from 3' to 3'3". We were very pleased indeed to see so many entries for this class and rest assured we shall take this into account when planning our Winter Showjumping series this coming Winter. The standard of showjumping was fantastic and we included the fearsome horseshoe jump, which at maximum height of 3'3" we were pleased to see caused none of our competitors any problems on the day - quite a surprise! The winners of the open class were Vicky Pollock and Colour Trend who rode a fantastic round which raised a good cheer from the crowd - congratulations Vicky! For our final class of the day, we decided to hold a feature class which we do not run very often: a six bar class. We can just about fit six upright jumps across the diagonal line of Ring 1 with two strides inbetween each jump and we were very pleased to have as many entries as we did for this class as it is a fun and exciting class to watch. And what a competition it was! After the first three rounds there were only two left in it, Lucy Jones riding Sparkie and Sonia Willoughby riding Winnie, who knocked down a pole each. Rather than settle for joint first place, our two plucky leaders decided to jump off to decide first and second place. Lucy and Sparkie went on to jump through clear, leaving the pressure on Sonia and Winnie, but just when we thought Sonia and Winnie might share joint first they went on to have an unfortunate pole down, leaving the winners of the six bar class Lucy Jones and Sparkie. Well done Lucy!